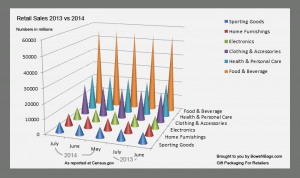 Ever wonder what industries are bringing in the most sales? 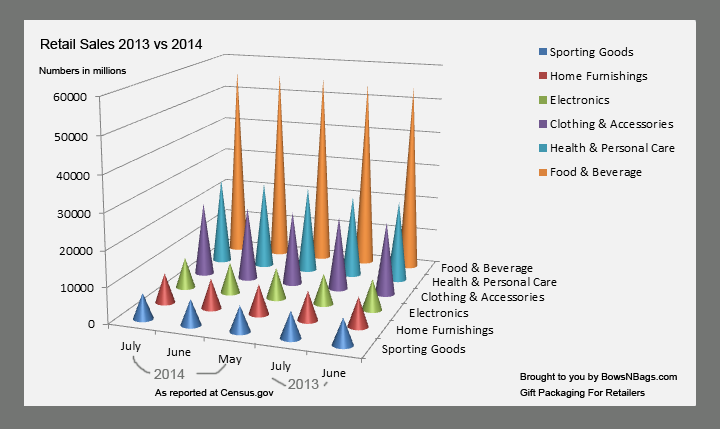 For retailers or people thinking about becoming a retailer, the census.gov website publishes these figures by industry. The latest report was released August 13, 2014. We have created an easy to read graph that shows which industries have made the most revenue in the last quarter. The food and beverage industry comes out the winner. In the month of July, 2014, this incredible industry brought in $55,890,000,000. $55 billion dollars in sales makes the food and beverage industry the most lucrative of the group. Other notable sales came from the health and clothing industries. Coming in second the health and personal care industry brought in $25,114,000,000 billion, almost half of what the food and beverage industry brought in. The clothing industry raked in $21,205,000,000.